As the Commander of the 50th General hospital during Operation Desert Shield/Desert Storm (1991), I got to know Col. Don Trunkey pretty well. He was our Chief of Professional Services and was always busy keeping the medical/surgical side of things on a straight and narrow path. He presided over our M and M (Morbidity and Mortality) Conferences, and tolerated no nonsense in professional performance or behavior. This was accomplished in the company of a splendid sense of humor. When LTG Yeosock, our 3rd Army Commander, developed a gallbladder infection and needed surgery, I asked Don to manage the situation as I knew if I were to get involved, I would end up as a middleman which would create a problem-prone situation, not to mention adding unnecessary delays . Don met with GEN Schwarzkopf (the Central Command Commander-and LTG Yeosock’s boss) to advise him how medical treatment for LTG Yeosock could be managed; and a decision was made to evacuate the general from the theater of operations and have him treated in Germany. Don and Col. Dan Cavanaugh, one of our General Surgeons, went to Germany with their patient, and performed the surgery. A quick recovery and return to duty followed; setting the stage for the initiation of the Allied ground offensive. As one of the nation’s leading trauma surgeons, Don was always an advocate for documenting wound management and preserving this data for analysis; so that any information that could be identified as ‘lessons learned’ would be on record. He was particularly interested in seeing that this was done during Operation Desert Storm. I remember sitting down with Don at Fort Lewis as we were being out-processed for discharge from active duty, and together working on a large stack of Officer Efficiency Reports which were due at that time. Misery does love company. Don was recognized by the AMEDD (Army Medical Department) for his distinguished career and his contribution to military medicine by induction into the Order of Military Merit. Recognition he justly warranted. After the first Gulf War, Don joined with us in the 50th General hospital Association. In spite of the considerable distance between Seattle and Portland he and Jane were able to make several of our reunions, and enjoyed seeing old friends and visiting the Fort Lewis area. I first met Dr. Trunkey when he was on a T.V. show on Lifeline in 1978. I was a resident, I was thinking of going into trauma and seeing him being followed around the hospital at San Francisco General and actualize the job, talk about coordination of care to the patient, get after people that weren’t doing their job, and generally be a model of leadership created a distinction that I had not seen in my residency and modeled what I had been thinking about. Dr. Trunkey was a surgeons’ surgeon. He was big – yet jovial, he was charismatic – yet kind, and he called it like he saw it. He championed things and pushed for things, even when they created controversy. Those of us following in his footsteps saw that as a model for how to implement a program that would challenge the very fabric of health care delivery. His leadership affected hospital-based systems, prehospital care, the American College of Surgeons, and essentially everything he touched. He was certainly no man’s fool but tolerated people whose heart was in the right place in working toward the ultimate goal. My next encounter with Dr. Trunkey was again when I was a resident, I had decided to go into trauma and ATLS was being offered. We put on a course at the University of California which was led by Norm McSwain and Skip Collicott. Don Trunkey and Frank Lewis came out of the North at San Francisco General, both as leadership icons and participated in our course. Again, rather than as many trauma leaders at the time did, he did not dismiss ATLS but saw it as an opportunity for creating a common language. He threw himself into the course in all respects and we all had a great time getting to know him and following his leadership. Above all I recall his emblematic commitment to the trauma patient and their care. He led this through his positive influence perhaps more than can be currently measured. He did it with a sense of fun, a sense of purpose, and a devotion to the intellect and history that made things the reason to proceed. One seldom meets a person who when you mention their name gets the same reaction. For Dr. Turnkey it is immediate respect and a broad smile showing his friendly nature and his ‘never take yourself too seriously’ attitude. America trauma is different, as is trauma around the world because of his major contributions over forty years. Don has been my close friend and mentor for 50 years. I first met Don as a nurse in the Mission Emergency Room, San Francisco General Hospital, while pursing my premedical studies. His commitment to patient care and advocacy for the underserved populations in the city was incredible. He is the reason I, and many others, found trauma surgery such a gratifying pathway in our surgical careers. He has been a phenomenal mentor to scores of young surgeons throughout the world, both with his enthusiasm for and experience in trauma surgery. He has set the gold standard for excellence in trauma care- both the art and the science of trauma care. He is the ultimate educator, always willing to take time to share his expertise with all levels of medical providers, prehospital and hospital. He has been a relentless patient advocate. He has never been afraid to confront the ethical challenges of delivering the highest quality of trauma care, such as “the issue of “preventable trauma deaths”. His publications on the many challenging areas of trauma surgery are held in high regard by surgeons worldwide. Don is the “grandfather “of global surgery, taking his surgical expertise to vulnerable populations throughout the world, both through his role in the US Army Medical Corp and as a consultant to numerous international trauma communities. He loved to travel and share stories, both personal and professional, with his many international friends. All of us will always cherish our times with Don, and the impact he has had on the trauma careers of so many of his friends and colleagues. During the time Dr. Trunkey was at Madigan, I was assigned the first case of my career as an operating surgeon, a needle localized breast biopsy and I was shocked to find out that Dr. Trunkey, the famous trauma surgeon, was assigned as the attending. So, essentially, right out of medical school, I was doing a case with 1 of the top 5 trauma surgeons in the country. But it was a breast biopsy, not a GSW to the heart but Dr. Trunkey was very patient with me and even with a breast biopsy, he was able to teach surgical concepts I carried with me for the rest of my career. I considered the case to be a success because a trauma surgeon and a future trauma surgeon completed the case without massive bleeding! That very brief exposure to Dr. Trunkey at the beginning of my career played a huge role in my decision to become a trauma surgeon in the future. As the Chief of Trauma at OHSU, following in Dr. Trunkey’s footsteps, I feel honored to have learned from Dr. Trunkey and then later to have served as a colleague. In 1977, I visited several trauma centres in the USA, with particular reference to management of blunt liver injuries and spent three weeks at the San Francisco General Hospital with Don Trunkey. It was there that I witnessed a true resurrection. 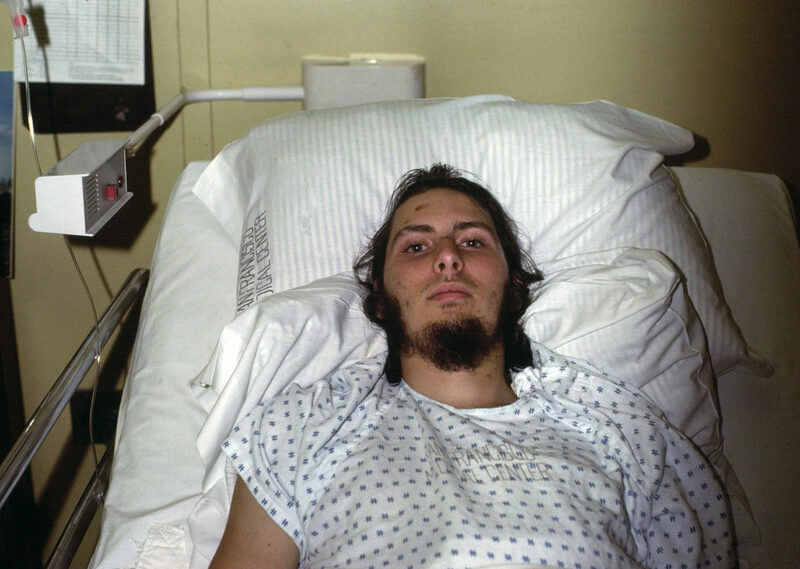 On Sunday afternoon 27th November 1977, I was seated in the Emergency Department when a call came through from the Ambulance Service regarding a teenage lad who had received gunshot wounds. He was walking along a footpath with his girlfriend after attending church, when two young teenagers jumped from behind a bush, grabbed the girl’s handbag and shot her. He went forward to resist the robbery whereupon he was shot in the lower abdomen and as he fell forward was shot again in the upper abdomen/chest. While being transported to the hospital, an intravenous infusion was commenced in his left arm. An ECG of the patient in the ambulance was shown on a screen in the ED while travelling to the hospital (I had never witnessed this previously) and, as the Ambulance entered the hospital driveway, the ECG went flat, indicating cessation of heart beat. He was immediately transferred to an operating table in the ED, while simultaneously being intubated and ventilated and a catheter inserted into his femoral vein and Don opened the chest. The heart was flaccid and not beating. He began internal cardiac massage which, together with the rapid intravenous fluid infusion and oxygenation via the endotracheal tube, resulted in filling of the heart and restoration of heart beat and circulation. There was a through and through bullet wound of the heart which Don repaired, together with splenectomy due to penetration of the spleen by the bullet. I am a little hazy about the intra-abdominal wound by the first bullet, but believe it was damage to the left iliac vessels which were repaired. Chatting to the patient and photographing him in bed several days later (photo) made the classification of a “resurrection” to be real. Don and his wife Jane have been close friends with Judith and myself for over 40 years and we have spent many, many wonderful times together in different parts of the world, which has included our combined love of wines. 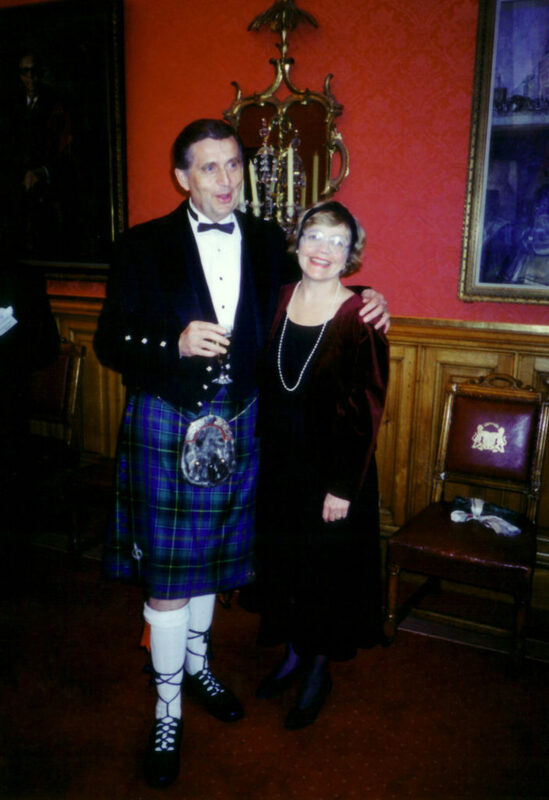 After some search, I have found a photograph of us together in formal dress (all the others seemed to have shown us with a wine glass in our hand) and one where Don shows his legs wearing a kilt. I also enclose a photograph of Don in the Australian outback on one of our trips. He is throwing a spear with a special device, generally called a spear thrower, which were often used by Aborigines to increase the distance they could be thrown, with an expert thrower (probably not Don) getting two to three times the distance he could throw without using one. They have a peg at one end where the spear fits in and the thrower holds it by the other end to throw the spear. 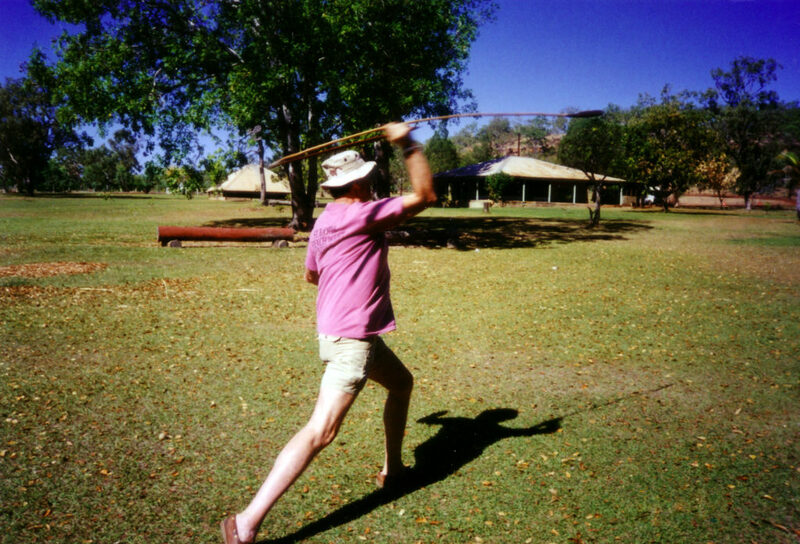 The spear thrower instrument is called Woomera. The town of Woomera in South Australia was the site where Australia was involved with the British in developing rockets and missiles, which seemed to be an appropriate name for the Indigenous weapon. Thank you for forwarding to me the information that you have collected about your dad. Back many years ago in the early 1970s, I had invited Don to be one of the lecturers at our annual trauma symposium, which is the oldest trauma symposium in America. At the reception dinner in the middle of the program, I was able to introduce Don to my new, young partner, Dr. Anna Ledgerwood, who grew up in the eastern part of the great state of Washington. Dr. Ledgerwood grew up in farm country where her parents were tenet farmers just outside of Pomeroy. Although we were not able to confirm definitely, Dr. Ledgerwood told us that her brother Mike probably competed against your dad on the basketball court when they were in high school. Needless to say, there was an immediate lifelong connection. Incidentally, Dr. Ledgerwood is still my partner and always keeping me out of trouble. You are very fortunate to be brought up by Don and Jane. Both are wonderful people. Recently, I had the assignment of expressing my views on the most important trauma and acute care surgeons that I have worked with in my lifetime. Rather than talk about all of the accomplishments that your dad achieved in his career, I believe that I can best summarize my thoughts of Don as it relates to this assignment that I accepted. In the carrying out of this assignment, I identified the most important trauma and acute care surgeon by decade. For the decade before Don and myself, I identified that the most important trauma/acute care surgeon in the world was Tom Shires. As you know, Dr. Shires was a very important surgeon in Don’s academic development after Don spent a research fellowship with Dr. Shires while he was still in Dallas, Texas. 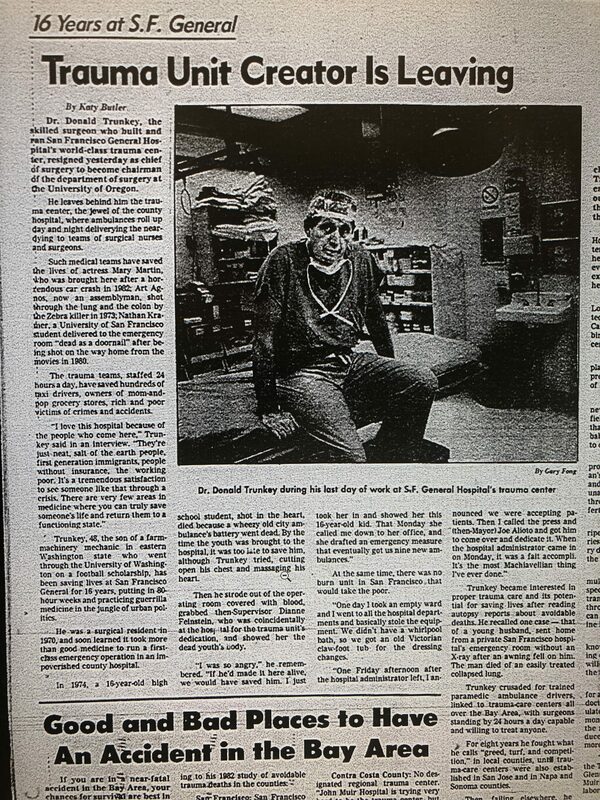 The most important surgeon for my decade was Don Trunkey. I summarized many of his national and international contributions, which are all nicely summarized by other authors who have contributed to your collection of information about your dad. Thus, I call Don the world’s most important trauma/acute care surgeon who was born in the 1930s. What more can I say about your dad! More important than all of his surgical contributions to the world, Don Trunkey is an outstanding human being. In the midst of all his scientific accomplishments, your dad was always a fun-loving individual who praised generously, accepted criticism graciously, and always was there to help somebody. As I think of your dad, I remember many situations where he went out of his way to help somebody, whether it was a student, a resident, or some stranger walking on the street without knowing exactly where to go. Throughout all of these encounters, he was always humble. When he was at a national meeting and some admiring resident would finally build up enough courage to ask him a question, he always quizzed the resident about his background until they were able to identify surgeons that both of them knew. Don would then tell stories about that particular surgeon, and by the time they had finished their conversation, the young, shy resident knew that he had a new, lifelong friend. He would also answer the question that led to the resident approaching him in the first place. When a practicing surgeon, be he a trauma surgeon or a surgeon who does not do much trauma, would stop to ask Don a question, it usually meant it was about a patient who had complications related to some surgical problem. Don would recognize that instantly and described some of the difficult cases he had that were similar to the patient they would be talking about. In his humility, Don would always identify some things that he did that, in retrospect, he would have done differently. The surgeon who started the conversation always felt rewarded and better informed because of Don’s lengthy discussion. Whenever Don was discussing a paper at a national meeting, he always went out of his way to succinctly support the presenter and co-authors and then go ahead and give his own opinions, which often were different than the authors. This was always done with great dignity and with great kindness to the authors who were presenting their own biases about the treatment of some particular surgical disease. He was always fun-loving. I remember when I was at your place, which was next to the river. And Don would talk about floating down the river with an inner tube like a teenager might do. He was never too important to have fun like a youngster and to share in that fun with his gray-haired colleagues. One of his greatest traits was his empathy for somebody who was in the midst of a crisis. His words and the look in his eyes always came from the heart as he shared in the painful experience of the other person’s crisis. In summary, Don Trunkey had wonderful parentage, and he chose a wonderful woman to be his wife. I first met Don Trunkey when I was a resident in Surgery in Texas. He was a few years older than me, and was always very cordial and gracious. Many aspects of our career were similar. We both did broad based surgery, but had a particular interest in the organization of trauma care. I would not in any way want to infer that my impact in that regard is anywhere near that of Don, but it allowed me to understand the passion he felt for that cause. Through the years, Don was a visitor in Kentucky on numerous occasions. He and Jane were always great friends, and my late wife, Suzanne, really enjoyed them both. She was particularly fond of Jane. One could look at a curriculum vitae of a person and glean certain things about their life. In reviewing Don’s life accomplishments, there were certainly many. He was a recognized leader of surgical organizations, and I believe if one asked 100 well-informed surgeons with an interest in trauma, “Who was the most influential person in that field in the last 50 years?”, virtually all would have the similar response of Don Trunkey. That is a tremendous legacy for any individual in any field of endeavor. However, laudable Don’s accomplishments, they really paled beside the enormous personality that he’s always exhibited. To know Don, even casually, was to never forget him. I can remember numerous dinners that we had informally at various meetings, where he would expound on the virtues of some wine he was making or some new food or beverage (usually the alcohol containing-type) that he had recently encountered. This was always delivered with great gusto and bravado. Don and I have both shared an enormous love of learning beyond medicine throughout our lives. We were always sharing book titles with each other about a variety of topics and genres. Truly, Don’s larger than life persona made him, in my mind, even more remarkable than his many accomplishments in the field of surgery. It is my understanding that Don is not exactly himself today, but I certainly hope he realizes the great affection I have for him personally. I know many of our mutual friends feel the same way. To have known Don through these many years is to have been blessed with his enormous charisma and charm. When I arrived to begin my trauma research fellowship at the University of Texas, Southwestern Medical Center in August of 1971, I was assigned to share laboratory space with another trauma fellow. Upon entering the lab, I noticed my new colleague concentrating on the electrical wave forms displayed on the screen of a very complicated piece of machinery. He turned, showed the grin that would become the defining characteristic of his personality, and welcomed me. Don, my new lab-mate, proceeded to introduce me to all the research team members. I soon met Jane, Kristi and Derek; after my first son was born in February of 1972, Jane became his baby sitter. We had a wonderful professional and personal friendship during that year; fortunately for me, that relationship continued throughout our entire careers. Don returned to San Francisco General Hospital and I stayed for a second year of research before finishing my training and joining the faculty at the University of Louisville. Don was making major contributions to the knowledge of trauma systems in the late 1970’s and early 1980’s; his advice and guidance were invaluable as I began to develop a trauma system for the state of Kentucky. I loved watching Don use humor and intelligence to become a surgical leader and to work with him while he became, in my opinion, the foremost academic trauma surgeon of the last half of the 20th and the first two decades of the 21st century. Most valuable, though, was the personal relationship with Jane and Don. For nearly two decades the “Sun-fun family”, our group of four trauma surgeon couples, vacationed each January on a select Carribean island. We cooked, ate, drank, told tall tales, made up funny names for one another, and laughed constantly. Jane and Don set the tone that guided the Sun-funs. To be able to live that experience was a joy, a privilege, and an honor that I will treasure forever. Don Trunkey, as my fellow surgical resident Brian Gilchrist liked to say, was Lincolnesque. Always a calm demeanor, always a joke or an anecdote ready, and always leading others where they were afraid to go. Like Lincoln he was tall, lanky, and folksy and was raised in a rural environment among family that favored hard work. And like Lincoln, he rose to the top of his profession. I never heard Don Trunkey character assassinate anyone. The most negative thing, and it’s not even all that negative, I ever heard him say about another surgeon publicly or privately, was, ‘He’s an iconoclast’. Some people might even say that’s a compliment! And that attitude of acceptance permeated down from him into the surgery faculty at Oregon. I consider myself very privileged to have trained with him. Many physicians can look back in their life and find a pivotal point, an event that changed the direction of their lives. They may even have several such moments. It could be the day they decided to become a physician, or the day they picked their specialty. For me it was the day I decided to finish medical school and become a general surgeon. I would like to say thank you to the man who created that pivot in my career. I might not have had a career in medicine if it were not for the influence of Dr. Donald D. Trunkey during my fourth year of medical school at Oregon Health and Science University (OHSU). Our medical school curriculum was laid out to do the first two years in the class room learning basic sciences and the second two years in the surrounding hospitals and clinics. I slogged through the first two years awaiting the time when I could actually do the work of a physician. Physicians don’t just sit in lecture halls all day, they help make people well. I started my third year with a three month clinical rotation in pediatrics. I spent that whole rotation sick. Every bug that came into the clinic was passed on to me. More than one of my weekends were spent hugging the toilet with projectile vomiting. Often the kids couldn’t explain what was wrong, leading me to feel like I was practicing veterinary medicine, where you have to rectify the problem without the help of the patient. I was happy to move out of pediatrics into a different specialty. My next three month rotation was spent in OB/GYN. Working in OB/GYN, like pediatrics was not an enjoyable experience for me. The smells in the delivery room as well as the clinic were not to my liking. And the redundancy became unbearably monotonous. My third rotation, internal medicine, was at the Portland VA medical center. During this three month rotation the group of patients I saw kept coming back over and over again with the same problems. It seemed like no one was being healed. We saw patients with lung disease who wouldn’t stop smoking and diabetics who would return in crisis because they wouldn’t take their medications. I felt like I wasn’t making an impact on these patients’ lives because they weren’t getting better. At this point I was beginning to feel like medicine was not what I thought it was, and what I had been doing was certainly not what I signed up for. I became discouraged. All this work, all those years, and all that money to become a physician, what I wanted since I was a kid, was seemingly not what I wanted after all. I was on the verge of quitting medical school. My heart was no longer in it, which reflected in my medicine rotation grade; marginal with recommendation for another 6 weeks of internal medicine. I was pretty down on medicine. I had just recorded an album of original music which was a lot of fun. I began to compare the two options: Medicine vs. Music. But quitting medical school is a huge decision with some big consequences. I was on a military scholarship, so what would the Navy do if I quit? How would I feel if I quit? What would my parents think of me if I quit? Could I make a living as a musician? There were a lot of musicians that I knew who were better than me that didn’t eat very well and had to bum a ride to gigs. I decided I would go ahead and start the next rotation which was my final required block, general surgery. I started on Dr. Trunkey’s service. Here I was on the verge of quitting and I had to do a rotation with the new Chief of the Department of Surgery. He had only been there for about a year at that time, after having been recruited from San Francisco. As I started my general surgery rotation, knowing nothing about general surgery, I was assigned to my first day in the OR with Dr. Trunkey. Just the two of us. Can you imagine how I felt, as a medical student, who usually trained under residents or junior attendings, to be assigned to work with the head of the surgery department? I prepared by reading about the case and I felt that I was as ready as I could be, but I was a little apprehensive that morning as I left my apartment. I got to the operating room before Dr. Trunkey. When he arrived, the anesthesiologist was putting the patient to sleep. Dr. Trunkey seemed to be in a bit of a hurry. He looked at me and asked if I had ever put in a Foley catheter before. I said, “No.” I thought he would get on my case for that or snap at the nurse to get the catheter in so we could get going. But, that is not what happened. The great Dr. Trunkey said, “Go get some gloves and I’ll show you how.” He walked me through the steps and I put in my first Foley catheter. I don’t remember anything else about that day. There is an enormous gap between a medical student and the chief of the department at a teaching hospital. When he took me under his wing and said ‘let me teach you what I know,’ it changed my life. Maybe all my prior training was taught by a resident who was at the end of his rope, or a junior attending who was nervous about getting bad results, or a post call tired physician. As a medical student, you don’t often get to be the first assistant to a professor. There are just too many other residents and fellows wanting that spot. It was almost like I could hear music playing and angels singing. That day, I experienced what it was like to be a physician. I saw a true leader. I saw the physician I wanted to be. My attitude took a 180 degree turn that day. The rest of my time on his rotation was one of the best times I had in medical school. On this service, we were fixing things and healing people. If someone came in with appendicitis, we took the appendix out, saved their life and they never had that problem again. If someone crashed their car and ruptured their spleen, we took it out, saved their life, and it would never happen again. I discovered that I was a fix it man at heart. General surgery was just what I needed. My mind was made up, I would finish medical school and become a surgeon. My grades changed from marginal, to honors after that first day with Dr. Trunkey. It is possible to go from being a marginal student to an honors student in only one day. I know because I did it with a simple change of attitude. I did it because one man took me under his wing and showed me what it’s like to be a great surgeon. I went on to practice general surgery for 23 years and now I am teaching other physicians to have a better life with better financial planning. I don’t know how many medical students, residents, and junior faculty crossed paths with Dr. Trunkey over his career. He graduated from medical school in 1963 when I was only a year old. He stopped practicing medicine in 2007 at about the age of 70 when he was made surgeon emeritus and spent the next 8 years continuing to teach surgeons though lectures before fully retiring. Thousands of physicians were influenced by this one great man, not counting the hundreds of thousands of patients who were benefitted by his teachings in the world of trauma surgery. His influence also had a ripple effect to the thousands of patients I, and others like me, treated because of his influence. Thanks, Dr. Trunkey, for changing my life and making it possible for me to have a rewarding career in general surgery. One evening, in early February 1991, I was the surgeon on call. Following a SCUD missile attack I was called to the emergency room at 0300 hours to see a very ill VIP – LTG John Yeosock, Commander of the Third US Army. General Yeosock was suffering from acute cholecystitis and needed urgent gallbladder surgery. Because of General Yeosock’s senior command status, I asked Dr. Trunkey to come to the emergency room to perform a second opinion. Doctor Trunkey concurred with my diagnosis and recommended gallbladder surgery for the general as well. General Yeosock was devastated by the news as he shortly would be commanding all the Third Army Forces for the upcoming ground war portion of Desert Storm. General Norman Schwarzkopf, commander of all coalition forces, when notified of General Yeosock’s illness, began the search for a replacement commander. I had worked under General Yeosock as the Division Surgeon in1980 when he was Colonel Yeosock, the Chief of Staff for the Division. Because I had developed a great working relationship with him during that division surgeon assignment, he felt comfortable conveying to me how heartbroken he was about possibly losing his Third Army Command. I immediately spoke to Doctor Trunkey who took charge of the situation. He made an appointment to speak to General Schwarzkopf. These two giants of men spoke eye to eye in the General’s office, Doctor Trunkey assured General Schwarzkopf that we could operate on General Yeosock and have him ready for full duty in less than a week. Although initially quite skeptical, General Schwarzkopf finally agreed to the plan. Because of security concerns, General Schwarzkopf assigned his aircraft to fly General Yeosock and the medical team to Germany to have the operative procedure completed. Because this was just prior to the days of routine laproscopic gallbladder surgery, Doctor Trunkey stated that we would do the procedure through a mini incision and then use an epidural catheter for pain control. Doctor Trunkey and I completed the operative procedure in less than an hour and the General did well. In four days General Yeosock walked off the aircraft and reported to General Schwarzkopf that he was ready for full duty. In a few days the General would successfully command the Third Army in the biggest tank battle in history. Icon in Surgery by Karen Deveney, M.D., F.A.C.S. Don Trunkey is being honored by the American College of Surgeons (ACS) this month at their annual Clinical Congress as an “Icon in Surgery”, an honor which he richly deserves. Don was the leader among a small cohort of surgeons who played a major role in improving the care of the injured not just in the U.S., but across the world, by advocating for the development of standards of care for trauma patients and defining what specific expertise, resources, and personnel needed to be in place for a hospital to provide optimal care to those patients. After a rotating internship under Dr. J. Englebert Dunphy at the University of Oregon followed by two years in the U.S. Army in Germany, Dr. Trunkey travelled to the University of California, San Francisco (UCSF) to train in surgery, where Dr. Dunphy had assumed the chairmanship. He developed an interest in a career in trauma during his rotations at the San Francisco General Hospital (SFGH), which was then developing a reputation as a leader in the new specialty of trauma surgery under the direction of the skilled and charismatic chief of surgery, Dr. F. William Blaisdell. Don heeded Dr. Blaisdell’s advice to study with Dr. Tom Shires at Parkland Hospital in Dallas, one of the most prestigious centers for both care of the injured and trauma research. At Parkland, Don learned research techniques for studying cellular mechanisms in shock and fluid resuscitation. He returned to San Francisco and joined the staff at SFGH, continuing his basic research under an NIH Program Project Grant in 1972, at the exact time that Federal recognition of Trauma Centers was beginning. SFGH was one of the first such centers recognized. At that time, however, most injured patients across the U.S. were taken to the nearest hospital for care, without regard for their preparedness to care for traumatic injuries. The network of young surgeons who had trained at UCSF extended up and down the state of California, and among them was John West, a surgeon in private practice in Orange County who had completed the surgery residency at UCSF in 1973, just two years after Don. John was distressed at what he felt were unnecessary deaths from basic traumatic injuries such as splenic rupture due to delays in recognition and prompt treatment of their condition. He and Don co-authored a landmark study comparing mortality from equivalent injuries in community hospitals to that at SFGH, a well-equipped and well-staffed trauma center. The study demonstrated the superiority of the trauma center in saving lives. Throughout the U.S. were hospitals such as SFGH that had also demonstrated their expertise in trauma care. Surgeons at these hospitals were the major members of the Committee on Trauma of the ACS, a committee that had been originally formed as the Committee on Fractures in 1922, but formally reorganized as the Committee on Trauma in 1950. At about this time, trauma was being recognized as a major public health issue, with increased highway accidents due to the development of higher speed automobiles and the interstate highway system as well as inner city violence from knife and gunshot wounds. Don Trunkey had been appointed to the ACS Committee on Trauma where he served as its chair from 1982 – 1986, joining a small group of like-minded “rabble-rousers” to lobby the ACS for designating hospitals according to a system of standards of trauma care, described first in 1976 in a manual called Optimal Hospital Resources for the Injured Patient. It set standards for what resources, personnel, and policies a facility need to have to render ideal care and divided hospitals into Levels I, II, III, or IV based on minimum standards at each level. They also advocated for providers to be taught and tested in a rigorous course, the Advanced Trauma Life Support (ATLS) course, now in its 9th edition, but a hard-fought battle for acceptance in its earliest days. 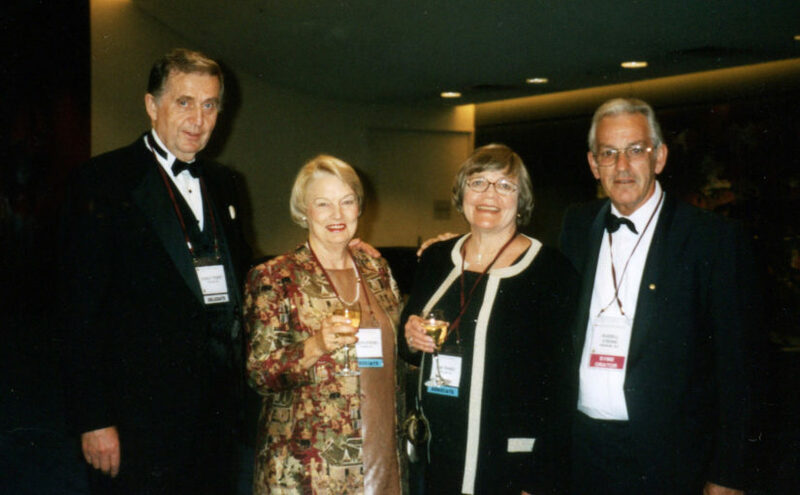 Don Trunkey was a key leader in development of all of the elements of effective trauma care. These now well-accepted principles, processes, and programs were not initially so readily embraced by the power structure in American surgery, because they represented radical new ideas in the staid, traditional field of surgery. They were, in a word, disruptive to the status quo. Don went on to lead the American Association for the Surgery of Trauma as its President in 1986, disseminate trauma systems standards, verification, and ATLS teaching throughout the world. 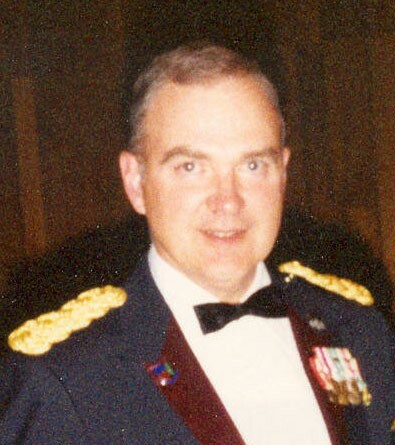 He also served in the U.S. Army as a reservist since his days on active duty in the early 1960’s, and was deployed to Saudi Arabia during the first Gulf war in 1991, where he served as commander of the U.S. army hospital based in Riyadh. In the aftermath of that experience, he issued a white paper that suggested necessary changes in military combat care to improve outcomes. Again, this report was met with resistance by those in positions of authority, but all of his recommendations have subsequently been adopted : most specifically, for improved pre-combat training of military surgeons for combat and standardized protocols of care, with damage control care near the combat lines and air evacuation as soon as possible to progressively higher levels of care. Don Trunkey was, more than any other single person, responsible for the development of sophisticated, state-of-the-art trauma programs in the U.S. His promotion of systematic, sound trauma care worldwide has saved countless lives. He has been tireless in his devotion to the cause and is a larger-than-life figure to all who know and love him. He is the perfect individual for the ACS to honor as an Icon in Surgery. The above remarks are drawn from both personal recollection as well as from the excellent account contained in the book, The History of the Surgical Service at San Francisco General Hospital authored by Drs. William Schecter, Robert Lim, George Sheldon, Norman Christensen, and F. William Blaisdell. Posted on October 29, 2018 October 29, 2018 Categories UncategorizedTags american college of surgeons, Army, ATLS, Gulf War, San Francisco, san francisco general hospital, trunkey1 Comment on Icon in Surgery by Karen Deveney, M.D., F.A.C.S. Dr. Donald Trunkey’s skill, judgment and indefatigable determination as a trauma surgeon has saved the lives of thousands of patients. In addition, his leadership in the development of trauma systems has saved the lives of millions around the world. In the late 1960s Don was trained as a trauma surgeon at San Francisco General Hospital, a busy urban trauma center. Don recognized that a reason for the success of San Francisco General Hospital was that a surgical team capable of managing a wide range of injuries was always available in the hospital and ready to respond immediately when an ambulance delivered an injured patient to the emergency department. The team approach was essential to prevent immediate death in injured patients from obstructed airway, impaired breathing and shock. As Don Trunkey pointed out in his manuscript Trauma published in Scientific American (1983; Vol. 249:28-35) a coordinated team was able to establish quickly a list of the patient’s injuries, and with prompt treatment prevent death during the “golden hour” following injury. The foundation of Don Trunkey’s advocacy for trauma systems was based upon lessons he had learned in the care of individual injured patients. Don Trunkey has been a prolific scholar. He has written over 100 manuscripts and book chapters in which he described the optimal treatment of a wide range of specific traumatic injuries. Additionally, Don Trunkey has authored over forty manuscripts that examined the influence of implementation of trauma systems of the survival of injured patients. His influential scholarship in support of trauma systems are evidence of his strategic vision regarding optimal health care. A seminal paper published by Don Trunkey with co-authors John West and Robert Lim entitled: Systems of trauma care. A study of two counties (Arch Surg. 1979 Apr;114(4):455-60.) had an enduring influence. The authors studied the patients who died of injury in Orange County, California, which did not have a trauma system, and patients who died of injury in San Francisco, California, which did have a trauma system. These authors determined that in Orange County many injured patients died preventable deaths, while it was a rare event in San Francisco. This study was used to convince the Orange County government officials to implement a trauma system. After the trauma system was established, and injured patients were taken to designated trauma centers, the outcome study was then repeated; preventable deaths had declined substantially in Orange County. This classic paper has been praised as a model of a process that could bring about implementation of a trauma system. The West, Trunkey and Lim study of preventable deaths in injured patients was duplicated by researchers around the United States who made similar observations of high rates of death among seriously injured patients treated in a hospital that is not a trauma center. These preventable death rates became the incentive for implementation of multiple other trauma systems. Don Trunkey has been an influential leader in Academic surgical organizations around the world. From the leadership podiums of these organizations Don Trunkey advocated for these organizations to make optimal trauma care of injured patients a priority. His influence on public understanding of medical issues has been enhanced by his persuasive style of presentation and articulate speeches. On one occasion he was featured on a documentary television show (Operation Lifeline. 1978-79) demonstrating the fulltime commitment that surgeons needed to make to treat seriously traumatized patients in those first critical minutes following injury. In the time period 1978 to 1985 Don Trunkey was an active participant and then leader of the Committee on Trauma of the American College of Surgeons. Don Trunkey described that he and his colleagues on the Committee were “busy trauma surgeons, and we wanted to change the care of trauma patients in the United States.” Don worked with the other members of the Committee on Trauma to establish programs that delivered enduring improvements to the care of injured patients. These programs include the Advanced Trauma Life Support course that has subsequently achieved worldwide distribution. The Committee members published a book that described what trauma centers needed to provide optimal care-i.e. Resources for Optimal Care of Injured Patients. During Dr Trunkey’s leadership of the Committee on Trauma that organization established a program that verified hospitals had the resources needed to function as trauma centers. There were critics of the process to provide oversight of trauma centers. Undeterred, Don persisted as a candid advocate for having seriously injured patients treated in trauma centers where an experienced team was continually ready. During his military service also called for optimal of casualties of war. From 1962 to 1964 Captain Don Trunkey, US Army Medical Corps, Reserves, served in Germany as a general medical officer. He returned to a military in service 1985. He was 48 years old, Professor and Chair of Surgery at Oregon Health & Sciences University and decided to apply for a commission as a surgeon the US Army reserves, explaining that he was “concerned there were not enough surgeons in the Army”. He would later say his only regret was that he did not return to the Army reserves sooner. 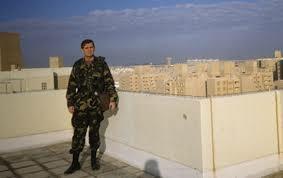 Colonel Trunkey and his hospital unit was called to duty for Desert Shield and Desert Storm in the fall of 1990. His military hospital was in Riyad, Saudi Arabia and treated injured form the SCUD missile attacks, and wounded soldiers evacuated from the battlefield. At the end of what was a brief war, when others were proclaiming success with a low death rates, Colonel Trunkey wrote an after-action report that was critical of several aspects of the Army Medical Corps response to casualties. He provided several recommendations for how the care of casualty could be improved. One enduring influence of Colonel Trunkey on the care of casualties of war was implementation of training programs in busy civilian trauma centers where military surgeons could acquire experience in the care of seriously injured patients. Multiple training programs were implemented and substantially improved the care provided to wounded soldiers, sailors and Marines during the war on terror following September 11, 2001 attack. Thousands of surgeons have met Don Trunkey and been inspired by his wisdom and dedication to the care of injured patient. Many young surgeons have vivid memories of Professor Trunkey taking an interest in their work. His ability to inspire surgeons has meant that Don Trunkey will have an enduring influence on the optimal care of injured patients long after his retirement through the work of subsequent trauma surgeons who perpetuate his commitment to the optimal care of injured patients. 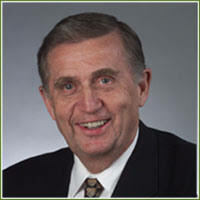 Richard J Mullins, MD, FACS. Don Trunkey spent 14 years on the faculty at San Francisco General Hospital (SFGH), the last 8 as the chief of surgery. He was an outspoken, confident, and decisive leader beloved by the staff, faculty, residents, students, and patients because of his warmth, self-deprecating humor, fairness, obvious regard for the opinions of others, and courageous stance to defend “doing the right thing”. He never hesitated to take what he felt was the right and necessary step to improve patient care, even if it was politically unpopular or raised the hackles of someone in power who had a secondary agenda to maintain the status quo or simply save money at the expense of the largely poor or minority patients who relied on SFGH for their care. After he had completed his surgical residency at the University of California, San Francisco, he spent one year with Dr. Tom Shires at Parkland Memorial Hospital in Dallas doing trauma research on cellular function in shock, then returned to join the faculty at SFGH in 1972. 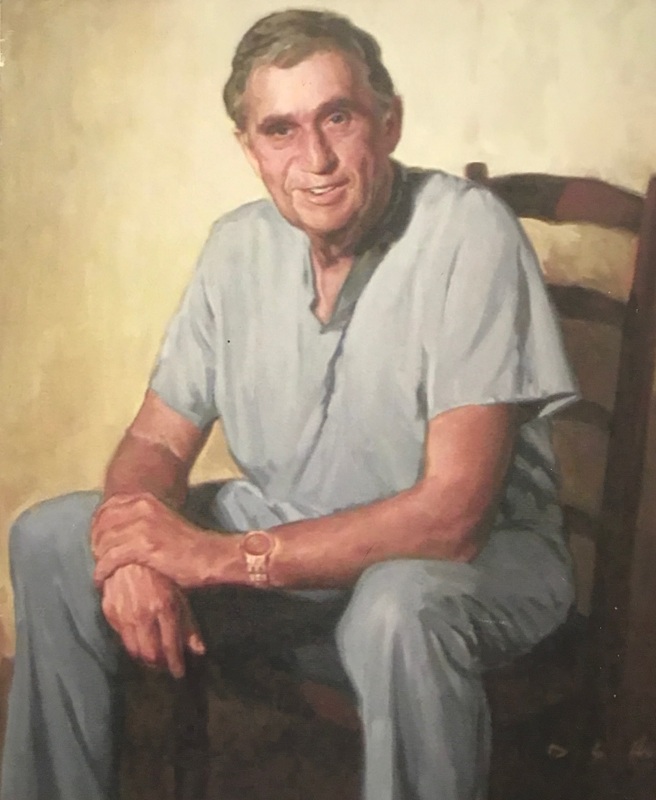 At that time the chief of surgery at SFGH was Dr. F. William Blaisdell, who had been a mentor of Don’s when he was a resident and had played a large role in influencing him to follow his footsteps as a trauma surgeon. Don established his academic research at SFGH on the pathophysiology of shock under an NIH grant and published extensively on the subject, while focusing his clinical activities on trauma and burns. He had learned a great deal about burn treatment while in Dallas, where the Parkland Burn Center was already established as a national model for care of the burn patient. At SFGH at that time, burn patients were admitted to any surgical bed that was open, not ideal for prevention of infection and management of the patients’ sometimes extensive wounds. They lacked, for example, a (hydration tank) or dedicated procedure room for dressing changes. Don wanted to establish a dedicated burn unit, which Dr. Blaisdell agreed would be a worthwhile and important step in improving their care. Unfortunately, Don discovered that the hospital director was opposed to the idea of a separate burn unit for financial reasons. Dr. Trunkey nevertheless pressed on, identified some empty ward space, recruited nurses for the unit, found an old bathtub to use, and invited the mayor of San Francisco, Joseph Alioto, to dedicate the “Alioto Burn Center.” Dr. Blaisdell invited the famous chair of surgery at Louisville, Dr. Hiram Polk, to give a talk at the dedication ceremony. City dignitaries were invited. Only on the day of its opening did the hospital director find out about it, but it was already a fait accompli, lauded by the mayor and Director of Public Health, who had found funding for it! When Dr. Blaisdell left San Francisco in 1978 to assume the chair of surgery at the University of California, Davis, Dr. Trunkey was appointed chief of surgery at SFGH. He served in that capacity for 8 years, until becoming the chair of surgery at the Oregon Health and Science University in 1986. Although he was only 41 when he became the chair of surgery at SFGH, he had already achieved international stature as a trauma surgeon due to his research, his publications, and his larger-than-life persona. Just the year before, he had co-authored a landmark study that demonstrated the superior outcomes of injured patients who were cared for in a trauma center rather than a private community hospital without special expertise in trauma. He became chief just as a property-tax limitation measure, Proposition 13, had been passed in California that severely decreased the funding available for public services, such as supporting a city/county hospital for the poor. Fortunately, SFGH had by then gathered such high regard as THE place to go if you were injured, that it was able to survive as an institution. Its survival was in no small way due to the skill, personality, and great accomplishments of its leader. Over the next 8 years he solidified the importance of organized systems of care in achieving good outcomes for the injured patient. He and a small cadre of his contemporaries on the American College of Surgeons Committee on Trauma (COT) established the Advanced Trauma Life Support (ATLS) system as a mandatory aspect of trauma care and developed a system of certification and verification of hospitals’ ability to manage trauma patients. He served as chair of the COT from 1982 to 1986. He became a director of the American Board of Surgery, President of the Society of University Surgeons, and President of the American Association for the Surgery of Trauma. Although Dr. Trunkey was required by his many national roles and his growing international fame to travel from San Francisco frequently, he assembled a distinguished and highly capable cadre of surgeons at SFGH, each of whom had gained expertise in the broad range of surgical and medical skills needed to provide the highest level of care for the most critically injured and ill of our society. He continued the research program begun under Dr. Blaisdell’s leadership, but expanded it to include more clinical and collaborative research. He developed the Trauma Foundation as a major force in trauma prevention. By the time Dr. Trunkey left San Francisco for his position in Oregon, SFGH had been firmly established as one of the nation’s foremost trauma centers and its existence was secure. He left an indelible mark on the institution. My Dad has really always been impressive to me. Growing up, he seemed to always be a little stronger, faster, and smarter at everything than me (and most other people too). He was an incredible athlete (I think he played 3 sports in high school and basket ball at WSU) and could beat me at everything, even ping pong which I played a lot as a kid. I once saw him throw a grown man over his shoulder out of a raft into the river in a water fight with only one hand on his life jacket. He has close to a photographic memory. He read about a book a week — usually history — and would remember most of it. He knew many constellations and individual stars that I just couldn’t retain the same way. But it took me awhile to realize that he was a really big deal in the world of medicine. I noticed the respect that the other doctors, residents, and nurses had for him on the rare occasion when I visited at work. 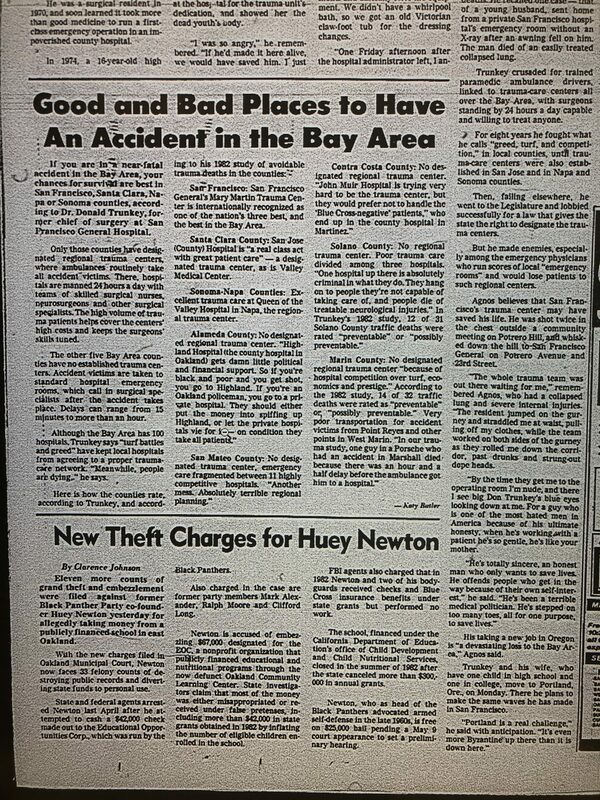 He was occasionally in the news paper and in 1978 he stared in an episode of Lifeline. That was amazing, but it was more about how he saved individual lives. My Dad’s true superpower was changing policy to save people by the thousands. He has a no-nonsense honesty and sincerity that either inspires or offends. He challenged the status quo and stepped on a lot of toes. He was hard to please but sincere in his praise when he gave it. I hope to have other doctors write more about his effect on policy as they know the details better than I do. One of the biggest examples of when I realized what a big deal he is, was at the party in 1986 that the hospital threw for my dad when he moved to Oregon. I heard many incredible stories that night about my dad. The main roast was by the mayor or former mayor and he had the audience roaring. I wish I had it all on video but I don’t. Please share your stories below if you were there. One story was about how he opened the burn unit while the hospital administrator was out of town. He invited the Mayor and the media so that it would be awkward to close right away. This part is captured in the newspaper article below. 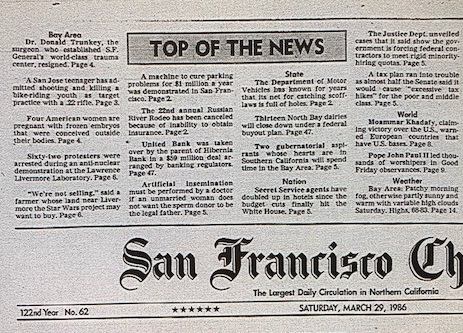 I also heard stories about the Moscone-Milk shootings, my dad threatening to fire doctors that wouldn’t treat AIDS patients, a patient with an arrow in his backside, a mugging victim shot in the heart in the alley behind the hospital (he lived), and numerous other amazing medical feats. To view the article: right click and save image to computer, then zoom in. Apparently, the big paper in The tech city is not yet digitized. My father is Don Trunkey. He was a renowned trauma surgeon and is finally retired to Idaho. This web site will be about his life and achievements. Donald Dean Trunkey was born, raised, and educated in the state of Washington. He graduated with an M.D. from University of Washington in 1963 in the hope of becoming a General Practitioner. He interned under J. Englebert Dunphy at the University of Oregon Medical School, who became his mentor and turned his focus to surgery. When Trunkey was drafted into the Army, Dunphy went to San Francisco to begin one of the first trauma centers. He brought Trunkey in to join him after his service, and also got him a surgical Fellowship in Texas. 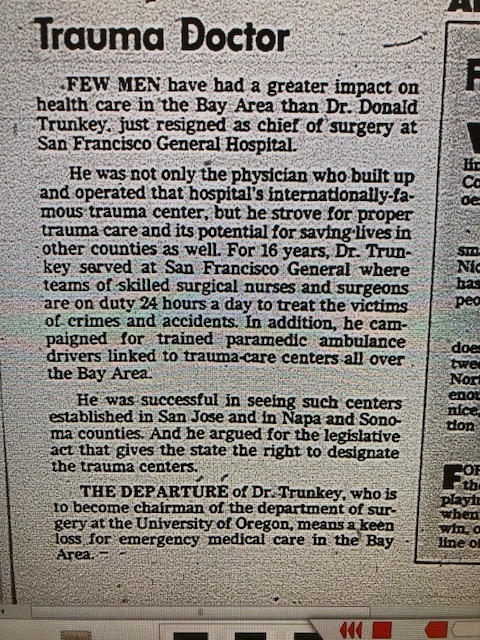 On his return Trunkey rose to become chief of surgery for San Francisco General Hospital for 8 years. He then came back to Oregon to build a trauma system as Dept. Chairman over the next 15 years. An important interlude saw him as chief of surgery in an army hospital in Saudi Arabia during Desert Storm. After the chairmanship he returned to teaching and lecturing on a global scale as a Professor and Professor Emeritus. His varied experiences influenced his thoughts and actions on trauma care. In the Army rampant alcoholism led him to institute A.A. programs. In San Francisco the drug wars of the ‘60s made him both an expert in gunshot wounds, and an advocate for controversial measures like gun control and drug legalization. Work with traffic accident victims led him to lobby for seat-belt and helmet laws. Likewise, exposure to the Texas Burn Unit not only led him to replicate one in San Francisco, but also to research fire-retardant clothing and self-extinguishing cigarettes. His wartime service likewise gave him an up-close look at the current state and problems of combat medicine. Trunkey’s decades-long involvement with trauma and trauma systems led to new surgical protocols of both invasive and non-operative types; the authorship of hundreds of articles and book chapters; the delivery of innumerable lectures; and participation in over 30 professional organizations.